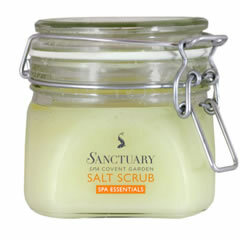 Today's review isn't of a new launch but a product that's been around for some time, The Sanctuary Salt Scrub. I quite like affordable spa brand, The Sanctuary, with my only complaint being that I'd prefer to see more of a natural emphasis. The Sanctuary Salt Scrub is available either in a weighty tub or a single use sachet, ideal for holidays or if you simply want to try out the scrub. The formula is surprisingly dry, with satisfyingly large grains of salt for an effective yet gentle exfoliation. It has a luxurious, spa scent which makes it feel really indulgent. Upon application, you start to notice the coconut, jojoba and sweet almond oils which make up the formula and this remains on the skin once you're out of the shower so there's no need to moisturise, a great time saver. I'm super impressed. My skin had been suffering somewhat from the effects of winter but it was left looking and feeling much better- it normally only feels like this in the summer! The tub costs £10.20 for 650g and the sachet is £1.50 for 60g. A great, wallet friendly scrub, highly recommended.